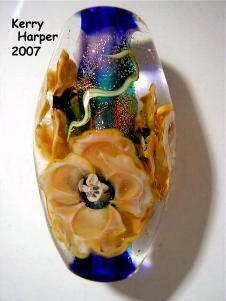 Have you ever wondered, what makes an established hot glass bead artist in our neck of the woods? Read here and find out all about it. This is (briefly) Kerry Harper’s journey. 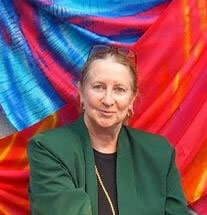 NOTE: Kerry is this year’s First Prize Winner for Art at The Sydney Royal Easter show! Kerry IS, literally a real winner, for she has won different awards in other art forms prior to winning this year’s first prize award for her lovely encased flower beads. In the pictures provided of Kerry’s artworks, we start off with a tassel she hancrafted. This tassel won first prize at the 2004 The Sydney Royal Easter Show and made it into the Standard of Excellence case. 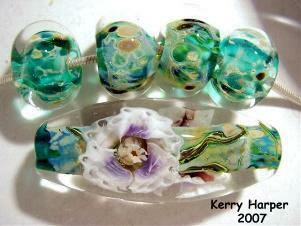 Something about Kerry: She has dabbled with lots of other crafts prior to lampworking, starting from early childhood. This includes working with all kinds of fibres and she has about 20 years experience in making tassels. She claims she has been influenced and encouraged by her mother, a painter and a bit of a sculptor, to develope in the arts. In addition, she has been seed bead weaving for 6-7 years. Please refer to the picture. Kerry’s daughter - Tracey, is wearing the Eye of the Tiger necklace. 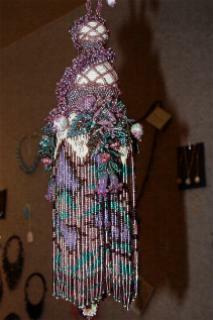 This won first prize for beaded jewellery at The Sydney Royal Easter in 2004. Please note: Kerry hasn’t entered any competitions, since then, until this year. 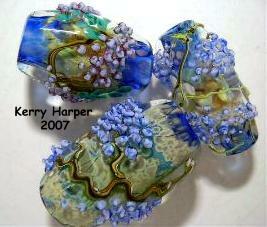 As for Lampworking: Kerry states that she has been making beads for nearly four years. 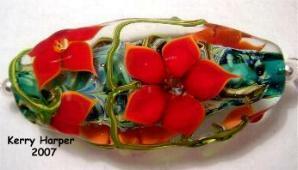 The lack of beautiful lampworked beads in local bead shops, prompted her attend a beginner’s class at a stained glass shop. Here, she said… “I learned about safety, how to light the torch, pull a stringer and twisty and how to make a basic round bead. 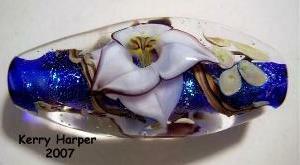 Everything else I learned from reading all the forum, meeting/sharing tips with my lampwork buddies once a month and practicing.” She claims she gets her inspiration from nature: colour, flowers, beautiful scenery, sunsets and mountains and working towards expressing it in beads in the future. About her Studio: Kerry said, it’s what used to be the pool side cabana and added because her bikini days are over (hehehe). 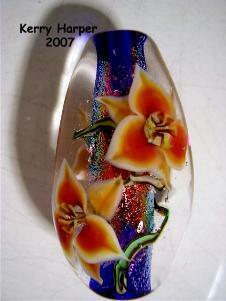 She handcrafts glass beads as a hobby and sells some to buy more glass to make more beads. About teaching others: Kerry doesn’t at the moment, because she considers herself still learning, disorganized and never writes anything down. It’s really by choice, because she enjoys “rediscovering the wheel” each time she torches. 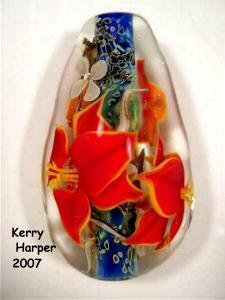 To name her most popular or signature bead, Kerry says “..it will probably be the encased red day lily flower. It’s the most popular.” She added, “…I like a little challenge…” that is, “…to get the flowers in there and keep the bubble out”. It is always a great honour to meet a fabulous hot glass bead artist, especially one who is so down-to-earth and whose skills equal or even better many overseas counterparts. 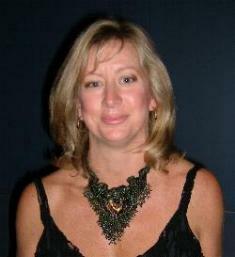 If you would like to meet Kerry and some of her handcrafted glass beads, she is available at the Water-front Craft Market at Como Marina, 2nd Sunday of the month. Come and see for yourself. Experience the magic but don’t forget your wallet because you wouldn’t want to leave without one of her encased floral glass beads once you've seen them and held one in your own hand!